Arsenal staged a late, late recovery to claim their first away point against a top five side since September 2012. Everton surprisingly went for a 4-6-0 formation with Steven Naismith in the false nine role, flanked by Mirallas and Lukaku. Gareth Barry fulfilled the anchorman role, with James McCarthy and Steven Pienaar (who Osman replaced very early on) just ahead. Arsenal continued with a 4-3-3/4-1-4-1 shape. Alexis Sanchez was the man chosen for the lone striker role, with Oxlade-Chamberlain taking his place on the right. Mesut Ozil returned on the left, as did Per Mertesacker at the back. Nacho Monreal also came in to the side at left back for perma-crock Kieran Gibbs. The first half was an extremely cagey affair with both sides attempting to sit off and play on the counter. This may have come as a surprise to both managers who, judging by their selections, clearly expected to be up against a side looking to play high up the pitch and dominate possession. The pacey Sanchez was surely preferred upfront to the hold-up merchant Giroud for this reason. Equally, Martinez’s decision to go with a defensive triangle in midfield speaks of a manager expecting to play against an offensively-minded side. Alexis Sanchez could be seen, on numerous occasions during the first half, gesturing in vain to his teammates to join him in pressing Everton’s backline, who were more than happy to pass among themselves to draw Arsenal out. Indeed the top four passing combinations in the first half exclusively featured Everton defenders, a measure of the space and time that they were given. Due to the absence of an Arsenal number ten, Gareth Barry was the only man on the pitch with no direct marker (his opposite number Flamini was being picked up to great effect by false nine Naismith). He used this freedom to devastating effect for the opening goal, chipping a delightful ball over the Arsenal defence for right full Seamus Coleman to head home. Coleman had been allowed to run clear by his man Mesut Ozil, who continues to show that he simply does not have the requisite defensive discipline to play against a marauding full back (see also Cazorla, Santi). Minutes later, Barry almost had a hand in a second. Free again in midfield, he chipped a long ball to Steven Naismith who had made a typical false nine run towards the ball. His headed flick on found Mirallas running in behind Calum Chambers, who could only shoot wide. Right on the stroke of half-time, Naismith would, controversially, get a reward for his fantastic movement. Romelu Lukaku rolled, and probably fouled, Per Mertesacker upon collecting a Jagielka clearance. He skipped the rash challenge of Calum Chambers (who was looking to dive in or get too tight all game), before playing in Naismith, who finished having just strayed offside. Those three chances were the only noteworthy ones of the first period. Arsenal had five shots on goal, but all five were wayward long range efforts from the wasteful Oxlade-Chamberlain. Acknowledging that Everton now had even less of an inclination to play high, Wenger removed Sanchez at half-time for his battering ram, Olivier Giroud . This switch almost immediately paid dividends, when a 46th minute chip over the top from Oxlade-Chamberlain found the Frenchman at the back post behind Coleman. He volleyed over. 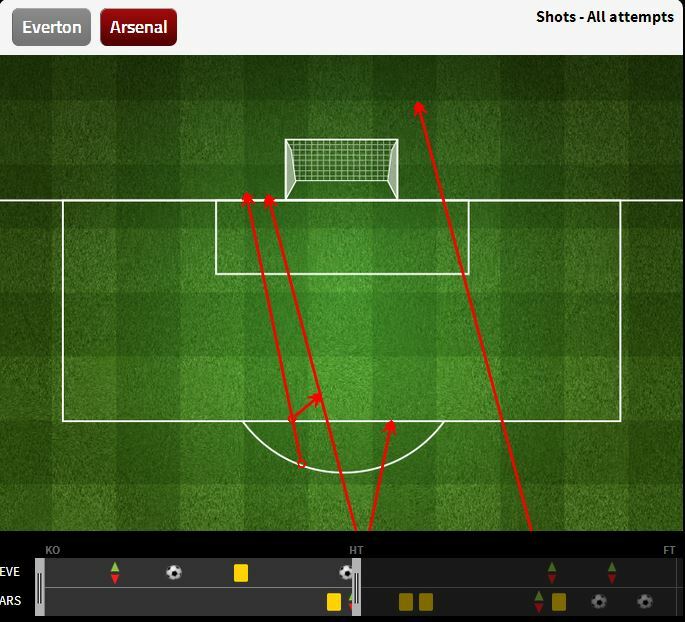 While Everton were now sitting deeper, their defensive shape was amazingly lax. Chamberlain was allowed to create that chance due to left-sided centre midfielder Osman getting attracted in. 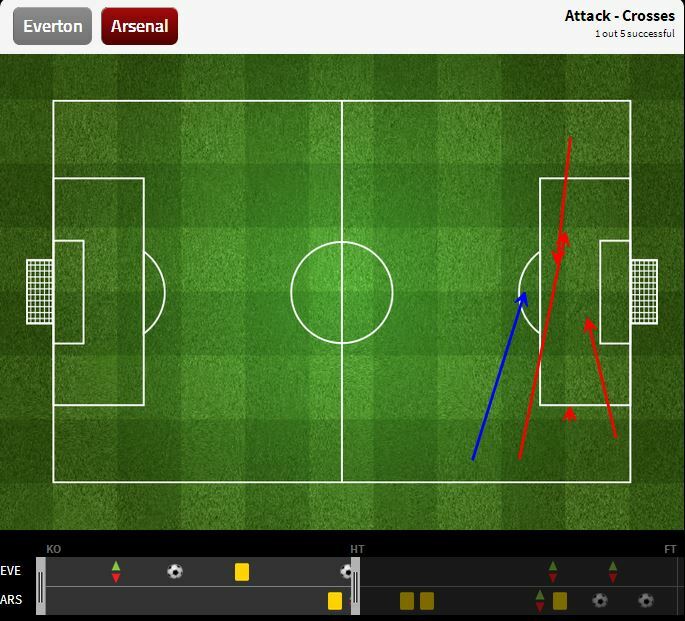 This left a massive space to Osman’s left for the Arsenal winger, as the left winger Mirallas was still up the field. This was a hallmark of the second half for the home side – they often found themselves with a bank of four behind a bank of only three, despite trying to defend a lead against a top side. Arsenal exploited this tendency to leave the wingers up through the more aggressive positioning of their fullbacks. 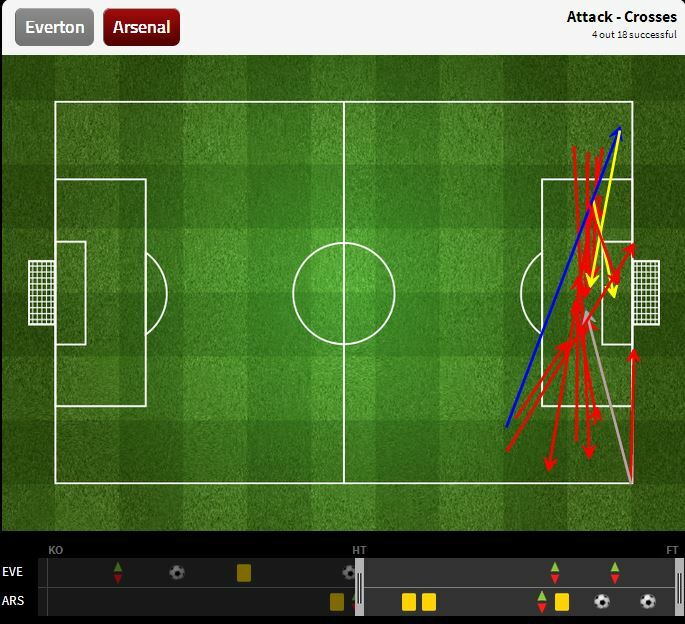 They attempted 18 crosses, as opposed to five in the first half, 11 of which came from Debuchy and Monreal. One from the latter led to Giroud’s late, late equaliser. Both managers cancelled each other out with the initial strategies. While Everton were certainly the more threatening side in the first half and deserved to be ahead, both of their goals stemmed from an Ozil error and poor judgement from the officials respectively. Arsenal came back extremely strongly in the second half, introducing the perfect number nine to play against a deep line, and pushing their fullbacks on to prevail upon Everton’s cavalier attitude to defensive transitions in wide areas. It was obvious here why Martinez, despite his deservedly burgeoning reputation, has a name for coaching defensively brittle sides. Three leads lost in two games is just not acceptable for a side with top four ambitions.